Week 1, Feb 2, 12-1pm: High Street, near intersection with Cashel, looking at The Crossing development by the Carter Group in light of the recent revelation of the extra-ordinary use of Ministerial powers to permit this development. Week 2, Feb 9, 12-1pm: Gloucester Street, new Colombo. Looking at the Impending demolition of the Camelot Hotel, the future Performing Arts precinct, the Library and other things in that area such as artwork, Tree Houses for Swamp Dwellers and Gap Filler’s Dance-O-Mat. Week 3, Feb 16, 12-1pm: Calendar Girls, Hereford Street near Latimer Square. Calendar Girls has been the subject of controversy over its possible demolition to make way for the East Frame developments. Learn more about this area of the city. Week 4, Feb 23, 12-1pm: Future Stadium, Tuam Street, near Madras Street. We’ll find out a bit more about where plans are at with the proposed stadium, learn a bit about stadium life, talk to some current tenants in the area who’ll be moved on when the stadium work commences, and hear a bit about the current car parking activities there. Week 5, March 2, 12-1pm: iSTAY…iGO – the demolition of the iSTAY building. Look for the Grandstandium on Manchester-Hereford-Liverpool Street, somewhere safe but close to the action. We will have a demolition contractor from Shilton and Brown come along to talk all about the process as well as live commentary! Week 6, March 9, 12 – 1pm: Standin’ on the corner, waitin’ for the bus (interchange). Some of the fastest construction happening in the city is the Bus Interchange building being constructed near the Colombo and Lichfield intersection – and scheduled to open this winter! We’ll on on Colombo Street somewhere, or perhaps in the car park just back from the street if roadworks require it. We’ll learn all about the ‘reversing’ controversy, and the sustainable building with the largest concrete pour in the city’s history. Week 7, March 16, 12 – 1pm: Boxed Quarter, cnr St Asaph and Madras Streets. We’ll be looking at the frantic (and long overdue) construction underway at Boxed Quarter. Is it a temporary project? A permanent development? Why has such a ‘light touch’ design been difficult to implement? We’ll hear from Robert Henderson of C-Lab, one of the current tenants. (He’s also the guy behind the ChCh bike share project.) And we’re trying to get one of the developers along for a chat too. Week 8, March 23, 12 – 1pm: Tuam & Madras Intersection. The scoreboard will be operational for this one, and we will enlist everyone’s help to count the illegal manoeuvres, cyclists on the road, cyclists on the footpath, etc. We’ll be joined by someone from local cycling advocacy group Spokes, and will explore in-depth the government’s Accessible City transport plan. And if we’re lucky, we might have some time to talk about the Innovation Precinct across the road. This is the final week of Eyes on the City – and we’re going out on a high. We’ll be parked up on Hereford Street, between Montreal Street and Rolleston Ave, to peek in at the Arts Centre building work and talk about all things art. Featuring special guests from the Arts Centre and Jenny Harper, Director of Christchurch Art Gallery/Te Puna O Waiwhetu. Our Grandstandium, a moveable 35-seat grandstand on a trailer, is being used for weekly events to check in on the progress of the city’s recovery. Eyes on the City is a regular Monday lunchtime event series where the grandstand is parked in view of a building construction site or area of road works. In this series, spectators can enjoy watching the laborious process of building the city, and learn more about proposed developments from on-site commentators. Contractors and other guests will also be invited to update observers on their activities as part of this project. The series began on Monday 2 February at midday, with a view of The Crossing development currently under construction in the block between Cashel, Lichfield, Colombo and High Streets. 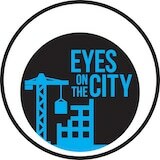 Eyes on the City will happen every week at the same time in different city locations. See above for the schedule. As the physical reconstruction of the city really accelerates in 2015, we want to make sure it goes hand in hand with the social recovery that we’ve been facilitating since shortly after the September 2010 quake. So we’re reaching out to the social networks we’ve established and creating events to keep people interested and engaged in new city developments as they’re underway. Eyes on the City are part of a big summer programme of events involving the Grandstandium that includes the inaugural French Cricket World Cup at the Retro Sports Facility, which is being run to coincide with the International Cricket World Cup (the proper Cricket World Cup). There are three leagues for children and adults (playing in pairs) to sign up for with games taking place across three weeks from 13 February – 8 March.